This Wednesday, a new hyperlocal app, Sup, launched in the iOS app store. 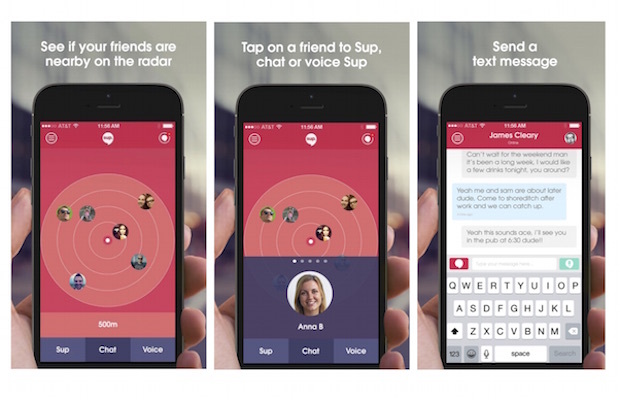 The app seeks to promote serendipitous encounters by showing users friends that are nearby. Hyperlocal apps are the next big tech trend, using location technology to provide the user with relevant information. But most hyperlocal apps, like Apple’s Find My Friends, compromise our privacy by broadcasting our exact GPS location. Creepy. The Sup app is different. It shows friends on a radar, not a map. So you can see that your friend is nearby, without tracking his or her exact location. By eliminating maps, Sup has set itself apart from other apps, creating waves in the hyperlocal community. Get the Sup app for free in the iOS app store today.